A super rugged mobile hydraulic cart for industrial use. Manually operated foot pedal pump. Durable, precisely engineered hydraulic cylinders. 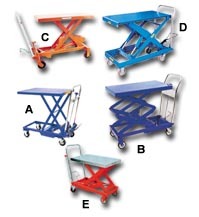 Easy mobility on four 5" x 2" polyurethane on steel (2 rigid, 2 swivel) casters. Standard with a Chrome Plated Platform except HCART-2000. Models with suffix TS feature two speed foot pumps. FOB Shipping Point. W x L Cap. (lbs.) Service Range Foot Pump Speed Wt. (lbs.) Price Ea.